This groundbreaking work shows how psychological and physical symptoms arise from damage inside the cell itself. 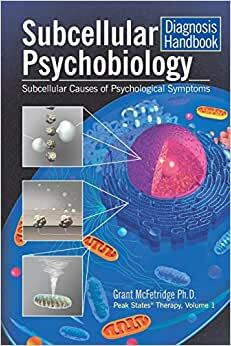 For the first time, psychological symptoms that range from trauma to serious mental illness can be understood as perceptions of biological problems at a subcellular level. This handbook is specifically designed as a desk reference for therapists and psychiatrists diagnosing and treating clients. Containing over 50 diseases and disorders of the cell, each entry gives a brief description of the cause, an illustration of the subcellular biology, differential diagnosis, and the standard psychological-like techniques that treat these biological issues quickly and effectively. This Peak States® Therapy volume is a companion to Peak States of Consciousness and The Basic Whole-Hearted Healing® Manual. This is a gold mine handbook of latest research into the new paradigm of effective, non invasive and drug free epigenetic healing. A must read for all cutting edge professionals in the fields of psychology, medicine and spiritual healing and the next step to gaining a fuller understanding of this epigenetic paradigm; made popular by researchers like Bruce Lipton.